If it's in the yard, it's an out. @kasonhowell is out here laying it all on the line. We've said it before, and we'll say it again. DO NOT run on @JuddWard1. Auburn would tack on another and Kyle Gray would get the first 2 outs easily in the 9th, then to see Tennessee load the bases, only to softly ground out to 2nd to finish the sweep. EXHAUSTING! But so worth it. Auburn now holds 75% of all of Tennessee’s losses for this season (17-4) and hold a sweep over one of the hottest teams in College Baseball. It’s also huge for the conference race, even if it is the first weekend. Series wins are what you want, so this extra win on the weekend gives the Tigers a cushion should something unfortunate happen down the road. All around, it was a GREAT weekend to be an Auburn Tiger. Tanner Burns is the easy pick here but I will go a bit off the beaten trail. Saturday started normally enough, through 4 innings, Jack Owen looked like Jack Owen, except for a lead off solo bomb in the 2nd which was his first run given up of the season. However, in the 5th Owen got to a 1-1 count when Butch Thompson came out and made a call to Brooks Fuller. Owen had alerted the coaches that he had some tightness forming in his arm so Auburn made the move as a precaution. Owen will be evaluated today but Thompson said Sunday that he expects Owen to start against Mississippi State this weekend unless something major changes. Fuller came in to a 1-1 ballgame and did exactly what Auburn asked of him as he went 3.2 innings of 2 hit, 1 run ball with 2 walks and 3 strikeouts on 63 pitches. Fuller has come in with a high set of expectations because of his last name and so far in his early career he is meeting those with flying colors. There is still a long road ahead of young Brooks but the way he was able to pitch around the Tennessee bats and protect a 4 run lead Auburn would give him in the bottom half of the 5th inning bodes very well for Fuller going forward.
.@Brooks14Fuller has turned in 3.0 scoreless out of the 'pen. Sometimes it takes a star player to get out of the blocks early in the season. If you ask him, that would be the case for Will Holland. 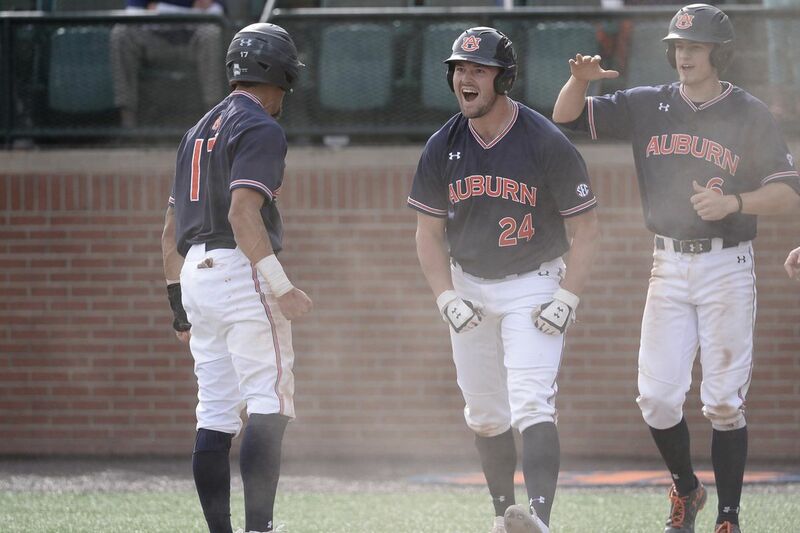 Don’t misunderstand, Holland has what Auburn has needed so far this season and other players have stepped up to provide at bats where you would expect Holland to have already filled, but this weekend showed a spark of the Will Holland we expected at the beginning of the season. On the weekend Holland was 3-10 with 3 runs scored, 2 walks and 2 stolen bases. It isn’t a dominate weekend by any stretch but again, it was what Auburn needed, especially in the stolen bases, which Auburn did at will against the Vols this weekend. Well, one Super Regional over and on to another! But before the Tigers take on Mississippi State, they will make a pit stop in Birmingham to take on the UAB Blazers. So far this season, UAB is 10-10 on the year and had Justas much of an up and down look to their season. Last Tuesday the Blazers beat a tough Troy team but then got swept in 3 games against Western Kentucky. The more telling stat about UAB though is their home record. The Blazers are 6-2 at the friendly confines of Regions Field. Garrett Wade should get the weekend start against another in state ball club as Auburn looks to add another notch on the streak before venturing in to Starkvegas.